Sure Line Electric is a full service Farmingdale electrician that has a comprehensive list of electrical services to make sure that your home’s system is in proper working order. State safety codes require a licensed electrician to complete all of the electrical work on a home so before you think about fixing an issue yourself or trying to wire your new home addition to save money, don’t! Call our experienced team of electrician to help out. We are fully licenses to handle all manner of electrical installation, maintenance and repair so you don’t have to worry about the safety of your home and family. The first step to diagnosing an unknown electrical issue is to get a complete electrical inspection from a license electrician. We follow specific guidelines to carry out a comprehensive analysis of your electrical system. We check everything from your wiring to your outlets and lighting fixtures to make sure that your system is in perfect working order. The great thing about these inspections is that it allows us to help pinpoint problem areas and to help increase awareness for potential areas of note. Don’t wait until you are plagued by electrical malfunctions to get us to help you inspect your system. In the event that we find any electrical issues in your system, the next step is to carry out repairs. We work tirelessly to find out all underlying causes so we can fix the source of the electrical problems, not just treat the symptoms, so to speak. If electrical issues are left unrepaired, there is the possibility that your system will face further harm and can even harm your appliances. 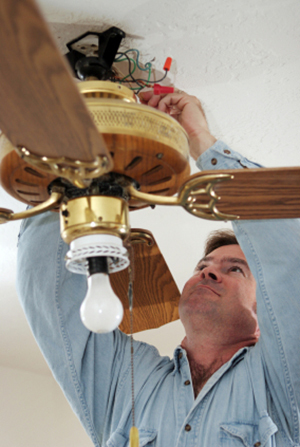 Call the licensed professionals at Sure Line Electric today for any electrical repairs needed. Your electrical panel, or breaker box, is a control system for you electrical wiring. Each part of your home’s electrical system is supposed to be hooked into a circuit breaker. The breaker does exactly what it sounds like – break the electrical circuit, or current, in the event of an overload on the system to prevent further problems. When your panel is out of date or if your electrical draw is overcapacity, your panel cannot function as it is supposed to and will be rendered useless. We recommend that you get your panels assessed and upgraded if your house outgrows the panel’s capacity. Give us a call to learn more about our Farmingdale services or to schedule an appointment at 631-240-9663, or fill out our request service form.